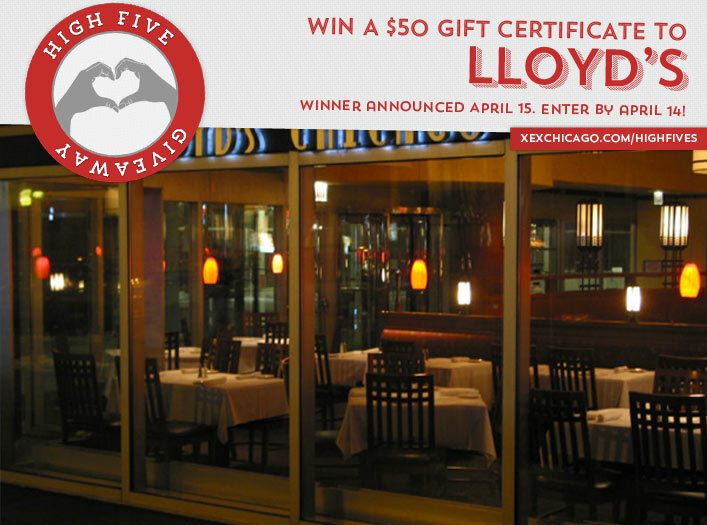 Win a $50 Gift Certificate to Lloyd’s! Congratulations to Milagros Marrero on winning our 120th High Five Giveaway! Thanks to all who entered. The menu features comfort foods in American cuisine. How about the 1⁄2 pound hamburger, a lightly breaded shrimp salad, the Cedar Wrapped Salmon, a Steak Sandwich, the Parmesan Crusted Lake Superior Whitefish or the popular Chicken Wings. The Frank Lloyd Wright inspired interior boasts a spacious bar, booth and window seating and an outdoor café. In addition to the main dining room, Lloyds has banquet facilities to accommodate business meetings, social gatherings & weddings serving buffet, family style, plated and cocktail receptions. Lloyd’s is located at 1 South Wacker Drive. Visit their website at www.lloydschicago.com or call them at 312-407-6900. What percentage discount do you get on hair services when you refer a friend to XEX? Now, just add a comment to this post with the right answer to be eligible to win! The winner will be announced on Wednesday, April 15. Entries must be received by midnight on Tuesday, April 14. Good luck! 30% off hair and makeup! Thanks, XEX is great! 30% off of hair services!!! I 30% discount on hair services when I refer a friend to XEX.